What are they? / Advantages and disadvantages. / Examples of applications where PFM crowns make a good choice. / Which dental alloy to choose? PFM's can be thought of as a hybrid between all-metal and all-ceramic dental crowns because they're made out of both materials. A metal alloy is used to create a thin thimble-like cap ("substructure") that fits snugly over the tooth. Porcelain is then fused over the substructure to form the shape of the crown and give it a white tooth-like appearance. Advantages of PFM's vs. all-metal crowns. The clear advantage of a PFM crown over an all-metal one is simply one of appearance. Its porcelain covering gives it a tooth-like look. And for teeth that hold a prominent position in your smile, that can be a vitally important factor. Advantages of PFM's vs. all-ceramic crowns. Just like with PFM's, all-ceramic restorations give a natural-tooth look too. But beyond that similarity, metal-ceramic restorations offer some advantages. PFM crown construction - A layer of porcelain fused over an underlying metal substructure. Due to their metal substructure, PFM crowns are the stronger type of restoration. Even if some of its surface layer of porcelain fractures off, the metal substructure underneath will characteristically stay intact thus maintaining the crown's seal over, and reinforcement of, the tooth. In comparison, the full thickness of an all-ceramic may fracture, thus compromising both functions. It's possible that some newer types of all-ceramics offer strength properties that are somewhat on par with PFM's. However, it's important to mention that porcelain-fused-to-metal restorations have a 50+ years track record of providing lasting and durable service. (Only all-metal crowns are superior or more proven in this regard.) In comparison, no type of all-ceramic even remotely approaches this benchmark. b) A more precise fit. Admittedly, on a clinical level this may only be of limited concern. But at least in theory, the less dependence the tooth-to-crown relationship has on its weakest link (the cement layer in between) the better. What are the disadvantages of porcelain-fused-to-metal crowns? a) They may wear opposing teeth. The porcelain surface of a PFM crown may cause significant wear of those teeth (or dental restorations) that touch against it. In comparison, all-ceramic and all-metal restorations have less of a reputation for creating this type of damage. In cases where a PFM's surface retains the glass-like glaze it received when made, this issue is usually of limited concern. However, in situations where a crown's bite has been adjusted by trimming and its porcelain is not re-glazed or polished adequately, excessive wear of opposing teeth and restorations may occur. People who have a habit of grinding their teeth are especially at risk. 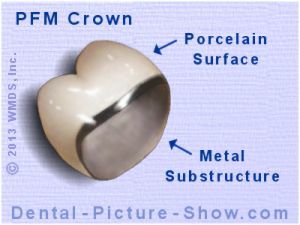 Although relatively rare, the porcelain covering of a PFM crown may fracture off from its underlying metal substructure. Fortunately, this type of mishap doesn't always render the crown useless. Its need for replacement will depend on the extent (size, location) of the loss and to what degree it compromises the crown's function or appearance. A study by Reitemeier (2013) [page references] determined that at 11 years 82% of PFM crowns had experienced ceramic defect. But only 1% of crowns required replacement. With just minor incidences, the chip or break is often ignored or polished/smoothed off. For larger fractures, it's possible that an in-the-mouth repair can be made. However, these types of patches can't be expected to offer the same predictable lasting service as crown replacement does. Ozcam (2002) evaluated 289 PFM restorations that had been patched (using a silane and dental composite technique). Repairs that failed typically did so in the first 3 months. At 3 years after placement, 89% of the fixes were still in place. In cases where patching is not possible (the tooth can't be kept saliva-free during the repair process, repair has been repeatedly tried and failed) crown replacement is the only alternative. c) Challenges in creating a truly lifelike look. Most dentists would probably agree that it's easiest for them to achieve the most natural-looking results when placing an all-ceramic crown vs. a porcelain-fused-to-metal one. Because there's no metal substructure to hide, with an all-ceramic crown a greater portion of the restoration's total thickness can be made using relatively more-translucent porcelain. That's important because it's the kind of ceramic that typically mimics the look and luster of natural tooth enamel the best. In comparison, the metal substructure of a PFM must be masked by placing a layer of very opaque (chalky-white) porcelain over it. And having to do so reduces the total thickness of translucent ceramic that can be used to make the crown. PFM vs. All-ceramic: Which to choose? This issue about appearance is just a difficulty with PFM's, not an impasse. When selected for the right applications (ones where the tooth can be trimmed in ideal fashion), the look of a porcelain-fused-to-metal crown can be exceedingly lifelike. In situations where the restoration holds a prominent position in the person's smile and therefore its appearance is critical (like with incisors or eyeteeth, and especially in cases where just one or a few crowns are being placed), opting for an all-ceramic might make the better-matching choice. When a set of crowns is placed (like all 6 or even 8 upper front teeth), uniformity is created and that alone often allows a smile to look acceptable to others. If so, then either type of crown could make a suitable choice. For front teeth that show relatively less so and therefore their appearance isn't as critical (like the situation where a person has a long lip line) the issue of esthetics might not be much of a factor at all. The issue of the dark edge showing is never an issue with an all-ceramic crown. d) The "dark line" phenomenon. Another potential problem associated with porcelain-fused-to-metal crowns is one of managing how their metal substructure's edge remains hidden. 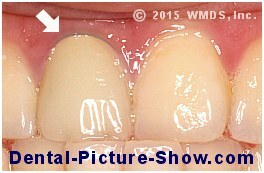 If changes such as gum recession occur, the appearance of a tooth that's been crowned with a PFM can be spoiled by its metal edge (dark line) that then becomes visible. For teeth that show prominently (like the front tooth of a person who has a high lip line), this can be an important issue. For many people however, this portion of their tooth may not be readily visible, and therefore of just minimal or even no concern. The gum line has receded on this PFM crown and now its metal edge shows as a dark line. Preventing recession by practicing diligent oral home care is the best solution, although admittedly sometimes recession occurs anyway. Dentists do have a couple of ways they can deal with this difficulty, either planning ahead for it or trying to resolve it if it occurs. Both approaches do however typically involve compromises. If no other solution is possible, a new crown will have to be made. Based on previous events, your dentist will have to advise you as to how likely or when they think the dark line problem might be expected again. Keep in mind that in cases where this issue is a concern or has been a problem in the past, placing an all-ceramic crown avoids this matter altogether. e) Greater tooth reduction is needed. Porcelain-fused-to-metal dental crowns require a greater amount of tooth reduction (trimming) than their all-metal counterparts. For example, metal crowns can be as thin as 1.5 mm on their chewing surface whereas PFM crowns need to be at least 2 mm thick. An example involving back teeth. Sometimes creating enough clearance is difficult with molars. If the tooth is trimmed in ideal fashion, doing so may make it so short that the finished crown might not stay in place well. If the tooth isn't trimmed enough, the crown's metal might not be thick enough for proper rigidity or its porcelain thick enough to look natural. In this type of instance, an all-metal (or at least a crown with an all-metal chewing surface) would make the better choice. An example involving front teeth. Creating adequate reduction can sometimes be difficult with front teeth too, such as the case where the dentist feels that trimming aggressively might encroach on the tooth's nerve tissue. For teeth that show prominently, only being able to trim a minimal amount of tooth structure may result in a PFM crown that looks acceptable but not fantastic (due to it just having a minimal thickness of translucent porcelain). All-ceramic crowns generally require a similar amount of tooth reduction as PFM's, but tend to give a more lifelike result due to their greater thickness (in percentage terms) of translucent porcelain. Selecting the type of alloy that will be used to make your PFM. The metal substructure of a porcelain-fused-to-metal crown can be made out of any one of a number of dental alloys specially formulated for this purpose. Based on their past experiences, your dentist will probably have an opinion about which ones tend to make their job easiest and produce the best results. Your insurance policy may only provide benefits for certain classes of alloys. High-noble alloys have a composition that's over 60% gold, platinum and/or palladium, with over 40% of the formulation being gold. These metals have the advantage that they are the easiest and most predictable to work with. Using them usually insures the most accurate crown fit and the most predictable bond with porcelain. Alloys in this group have a noble metal content (gold, platinum and/or palladium) that's over 25%. These alloys have a formulation that's less than 25% noble metal. They're typically high in nickel, chromium and/or beryllium content. Biocompatibility (some people are allergic to these metals) and corrosion are sometimes a concern with these materials. Which type of alloy makes the best choice for a PFM? You may need to decide. Your dentist may ask you to make a decision about which type of dental alloy should be used to make your porcelain-fused-to-metal crown. In most cases, their need for a response is related to the issue of restoration cost. High-noble alloys cost more than others. However, since there is relatively little metal in most PFM's, the cost difference between choosing a precious and non-precious one may be fairly minimal. Possibly on the order of $50 (or even up to $100) per crown. Dental plans sometimes limit the types of alloys for which they provide benefits. Or only pay for a certain type and if you choose a more costly one, you pay the difference. Which kind of PFM alloy should you choose? Most dentists will probably tell you that a high-noble one usually makes the preferred choice, if your finances allow for it. As mentioned above, precious metals offer the advantage that they are the easiest and most predictable to work with (for both the dental laboratory and the dentist). Selecting one helps to insure the most accurate tooth-to-crown fit and the most predictable bond with porcelain.